When it was released 16 years ago this month, Change and Challenge marked a departure in the provincial government's approach to economic development and diversification. The document subtitled "a strategic economic plan for Newfoundland and Labrador" laid out a long term approach to diversifying the provincial economy. It called for a transformation of culture, away from a dependence on government initiatives and government control and toward one based on individual initiative and private-sector entrepreneurship. The plan did not promise easy answers, nor did it fixate on one sector of the economy or on large megaprojects. Change and Challenge represented the result of a long development process that was itself crucial. The long period of discussion and consultation both inside and outside government helped to develop a consensus among those who took part in the discussions. Development of the plan lay with a economic planning group, appointed by cabinet in the summer of 1990 under the chairmanship of the premier's chief of staff, Edsel Bonnell. The group brought together a diverse set of individuals with an equally diverse set of ideas. There were within the group contending ideas, as former chairman of the Economic Recovery Commission Doug House describes in his book Against the tide. The process was not an easy one but the fruits of the group's labour proved substantial. It's echoes can be seen in government policy four administrations after it first appeared, even if the old fixation on resource megaprojects and government paternalism in all spheres has come to fill the vision of policy makers once again. Unfortunately Change and Challenge has not been available online before now. When it first appeared the Internet was in its infancy locally and so no electronic version was produced. To overcome that problem and to mark the anniversary of this historic achievement, Bond Papers will present the strategic economic plan, chapter by chapter, over the next several days. The original document contains charts and graphs, all of which were printed in black and white as a cost-saving measure. They are recreated here in colour, where possible. Other than that there have been no changes to the content. On behalf of the Government of Newfoundland and Labrador, I am pleased to present the Strategic Economic Plan which will determine the focus and direction of the Province's future economic development activity. This document is the result of nearly two years of research, analysis and public consultation by Government. On behalf of my colleagues in Cabinet, I wish to express our gratitude to the Advisory Council on the Economy for conducting and evaluating the public consultation process; to the 261 organizations and individuals who submitted formal briefs and to the many hundreds of people who participated in regional discussions; to the private sector working groups from specific industries who provided valuable background information and recommendations; to the Economic Recovery Commission and Enterprise Newfoundland and Labrador for their significant participation in the entire planning process; and to the many Government officials from various departments and agencies who worked diligently and effectively in the research, evaluation, and compilation of an enormous amount of economic data. The Strategic Economic Plan, in its final form, is the synthesis of hundreds of other documents, including statistical reference works, reports, working papers, studies, and briefs. The objective of the Cabinet working group of senior officials (the Economic Planning Group) was to produce a final document that would be as succinct as possible without sacrificing essential supporting data or background material. This is an Action Plan. The 134 action items in this document are not merely philosophical observations or even statements of intent; they are commitments by Government based on specific decisions of Cabinet. These decisions were made carefully, taking into account the representations made by special interest groups and the general public, and always in the light of our fiscal capacity to support desired economic initiatives. They are presented here in the context and sequence of the plan itself, and not in any particular order of priority. Implementation of the Strategic Economic Plan has already begun. Many initiatives were undertaken during the process of preparing the document. Others will start with the announcement and release of the Plan, but there are some programs which cannot be ready for implementation for months or even years to come. The Plan does not promise overnight miracles, but establishes the basis for economic recovery through sound, effective, and focused long-term planning. This is the only approach that can have credibility, because the people of Newfoundland and Labrador indicated clearly in the public consultation process that they would not take seriously any schemes that promised "quick fixes" or band-aid solutions to our structural problems. Indeed, in the pages which follow it will be shown that even if the province's growth doubled the national rate every year, it would take 20 years of such economic performance simply to reach the Canadian average. Finally, this document is not the end of the strategic planning process for Newfoundland and Labrador; rather, it is just the beginning. We live in a constantly changing global economic environment, and every day brings new challenges and new opportunities. Our economic strategy must always be flexible enough to accommodate change and to accept challenge. 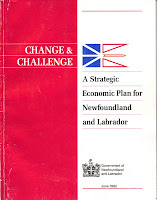 Change & Challenge is, therefore, a living document for the Newfoundland and Labrador economy in the latter years of the 20th century and beyond 2000. It is a plan prepared not just by government and business, but by the people of every region of the Province. That is what gives it the best prospect of success in charting the course for economic recovery and future prosperity. Budget 2008: Surplus? What Surplus? Chief of Staff: "I can't recall"
From the G&M: "The broken chain of answerability"
Rest in peace, Jack. You earned it.